This morning, I published "[Khobar Rampage:] Don't Be Afraid, We Won't Kill Muslims," an analysis of the recent Islamist rampage in Saudi Arabia, noting how the terrorists inquired into the religion of their potential victims and then killed non-Muslims while sparing Muslims. I hinted that readers might want to learn how to pass as Muslims for this could save their lives, then provided some tools how to do this. This weblog entry looks at further examples of murderers distinguishing between Muslim and non-Muslim hostages, what actions they take, and what non-Muslim hostages do to pretend being Muslims. Mr Gardner was hit in the abdomen, arm, shoulder and leg. As he collapsed he reportedly shouted out in Arabic to bystanders: "I'm a Muslim, help me." Nobody went to his aid and the men he had been questioning were seen running away. Close friends said last night that Mr Gardner, a father of two and a fluent Arabic speaker with a degree in Arab and Islamic studies, had not converted to Islam but was carrying a small copy of the Koran as a device to try to reassure militants that he might encounter. Agence France-Presse points out more generally that "carrying a small copy of the Koran [is] a device used by Western reporters to try to reassure Islamist militants." from Daniel Pearl's dying "I am a Jew" to Gardner's pathetic "Help me, I'm a Muslim," the holy warriors of Islam have made it plain: There are no magic words. The only good infidel is a dead infidel. We entered and found youths from the Arabian Peninsula [i.e. Saudi Arabia] wearing the ARAMCO uniform. They asked, "What is going on?" We told them, "Calm down, don't be afraid, we don't want you. We want only the Americans." We went to one of the buildings. Brother Nimr, may Allah's mercy be upon him, shoved the door until it opened. We entered and in front of us stood many people. We asked them their religion, and for identification documents. We used this time for da'wa [preaching Islam], and for enlightening the people about our goal. We spoke with many of them. At the same time, brother Hussein was on the stairs and noticed an Italian infidel. He aimed his gun at him and told him to come closer. The infidel came closer. We saw his identifying documents and decided that he should call Al-Jazeera and talk to his people and send them a warning about the war of Islam and its people, and that afterwards we would cut his throat and dedicate him to the Italians who were fighting our brothers in Iraq and to the idiotic Italian president who wants to confront the lions of Islam. We called Al-Jazeera and I told the broadcaster to speak with him [i.e. the Italian]. The broadcaster asked me, "Does he speak English?" I told the broadcaster, "Do you have Italian translators?" He said, "Yes," and I said, "Let him speak in his own language." He [the Italian] spoke for several minutes. I asked the broadcaster, "Did you record that?" He said, "Yes," and then the hero Nimr cut his throat. Comment: The veracity of this account is open to question, though those claiming to speak for Al-Qaeda generally have a history of actually doing so. In any case, the sentiments here certainly appear to be similar to those of the May 29 terrorists. Sep. 14, 2004 update: Well, the conversion-to-Islam feint finally worked. Canadian journalist Scott Taylor was seized earlier this month by Iraqi jihadists and held for a terrifying, brutal five days. Chained, handcuffed and blindfolded, he was subjected to death threats and beatings that pushed him "close to the breaking point." Pleading and bargaining for his life, he decided to fake a conversion to Islam. I told them that if I was about to die, a man shouldn't go to his death without a God. And when they said I wouldn't be killed right away, I said a man needs to pray to a God who has just saved him. They were skeptical, but then they began to believe I was serious. "All you have to say is that 'There is no God but Allah, there is no prophet but Mohammad'." The ploy succeeded; Taylor was released on a highway leading to border with Turkey and is soon planning to return to Canada. Comment: Conversions to Islam by abducted journalists are not always fakes. For an example of the genuine article, see the case of Yvonne Ridley, whose capture by the Taliban turned her into not just a Muslim but one of the Taliban persuasion. Aug. 15, 2006 update: For Sunni-Shi'i variant of this theme, see "Passing as a Shi'i in Iraq." Aug. 28, 2006 update: In the Scott Taylor mode, two Fox News television journalists kidnapped in Gaza faked conversions to Islam at the end of their two-week abduction. Steve Centanni (60, American) and Olaf Wiig (36, from New Zealand), were made to convert to Islam just hours before their release. They appeared in a video, dressed in Arab robes, announcing their conversion, and criticizing U.S. and British foreign policy in the Middle East. Centanni explained: "They forced us to convert to Islam at gunpoint. I have the highest respect for Islam and learned a lot of very good things about it, but it was something we felt we had to do because they had guns and we didn't know what the hell was going on." He then editorialized a bit: "I hope that this never scares a single journalist away from coming to Gaza to cover the story because the Palestinian people are very beautiful and kindhearted. The world needs to know more about them." Talk about the Swedish syndrome! On the 20th floor [of the Oberoi Hotel], the gunmen shoved the group out of the stairwell. They lined up the 13 men and three women and lifted their weapons. "Why are you doing this to us?" a man called out. "We haven't done anything to you." "Remember Babri Masjid?" one of the gunmen shouted, referring to a 16th-century mosque built by India's first Mughal Muslim emperor and destroyed by Hindu radicals in 1992. "Remember Godhra?" the second attacker asked, a reference to the town in the Indian state of Gujarat where religious rioting that evolved into an anti-Muslim pogrom began in 2002. "We are Turkish. We are Muslim," someone in the group screamed. One of the gunmen motioned for two Turks in the group to step aside. Then they pointed their weapons at the rest and squeezed the triggers. The head of the UN office in the Afghan city of Mazar-i-Sharif survived Friday's deadly attack by pretending to be Muslim, the UN special representative said on Saturday. The unnamed Russian chief 'survived because he claimed to be Muslim - although he was beaten, they let him go,' envoy Staffan de Mistura told reporters in the Afghan capital. Three European employees were killed in the mob violence later claimed by the Taleban - a Swede, a Norwegian and one reported to be Romanian. They had hidden in a secure room along with the Russian, de Mistura said. The Russian 'was separated because when they broke into the bunker, they saw him first and the others were hiding in the dark, and he tried basically to draw their (the attackers') attention to him,' the envoy said. The survivor speaks Dari, one of Afghanistan's two official languages, de Mistura added. 'He also spoke the language and for a moment he hoped by doing so, they'll think there was no one else left. But it didn't work out like that... The other three were killed, one after the other,' he said. Al Mulathameen, the Islamist group that has claimed responsibility for the attack, has made clear in statements to Mauritanian news outlets that foreign citizens were explicitly targeted. According to an Algerian man who worked on the site and escaped on Thursday afternoon, foreigners were separated from Algerian workers. The attackers told Algerians that they were their "brothers," the man said, speaking on the condition of anonymity from In Amenas, the city not far from the gas site. Perhaps 40 people, including 9 foreigners, were eating breakfast in the cafeteria at the site at about 5:30 a.m. when they heard gunshots, the man said. They remained in place until fighters entered the cafeteria at about 9 or 10 and began to separate the Algerians from the foreign workers, whose hands they bound. Five dark-skinned foreigners hid among the Algerians and were allowed to leave with them when they were directed into a separate building nearby, the man said. Workers whom the man identified as Pakistanis were placed among other foreigners, but argued with the attackers that, like them, they were Muslims; it was not clear how the attackers responded. "The terrorists went to the alarm station, switched off the alarms, and forced the deputy manager to show them where the expats were. They rounded up the expats, making them all wear explosives around their necks while standing in a circle. The attackers were carrying Kalashnikovs and bombs and went throughout the complex, seeking out expats hiding, and forcing them into the circle." He said more than 20 British workers – whom the terrorists called 'kuffar', meaning non-Muslims – were rounded up. He added: "Us Algerians were rounded up separately and were treated with kindness. We were told that because we were Muslim we would not be killed, and it was only the Christians they were after. The terrorists allowed the Algerians to send texts and make phone calls, but to stop the expats communicating, they forced an Algerian telecommunications man to cut network connections for mobile, internet and power. But a back-up system kicked in, which allowed some Brits to send text messages." Sep. 21, 2013 update: The Somali Islamists who today attacked the Westfield Mall in Nairobi, Kenya, killing at least 39, in the process separated Muslim from non-Muslims. As the attack unfolded shortly after noon Saturday, the al-Qaida-linked gunmen asked the victims they had cornered if they were Muslim: If the answer was yes, several witnesses said, those people were free to go. The non-Muslims were not. ... The gunmen told hostages that non-Muslims would be targeted, said Elijah Kamau, who was at the mall at the time of the midday attack. "The gunmen told Muslims to stand up and leave. They were safe, and non-Muslims would be targeted," he said. Al-Shabaab's Twitter account proudly asserted this segretation: "Only Kuffar were singled out for this attack. All Muslims inside #Westgate were escorted out by the Mujahideen before beginning the attack." Sep. 23, 2013 update: The Nairobi attackers asked for the name of Muhammad's mother (which happens to be Amina bint Wahb). According to a Christian, Joshua Hakim (who survived by covering his first name and only showed his Arabic last name), they asked an Indian man, "What is the name of Muhammad's mother?" and when he could not answer, "they just shot him." Sep. 28, 2013 update: The Daily Mail reports that some Nairobi mall attackers "took the time to divide Muslims from non-Muslims after demanding that some recite the Shahada," the profession of Islamic faith. stops three truck drivers on a highway believed to be across the Iraqi border and asks them how many times they bow during dawn prayer, an easy question for a pious Muslim. The men, who are Alawites, guess incorrectly. The fighters pronounce them infidels, make them kneel by the side of the road and gun them down. Then one fighter throws a Molotov cocktail into one of the trucks, setting it on fire. Nov. 15, 2013 update: Tuvia Tenenbom offers another, far less serious, reason to learn the Fatiha at "A Funny Thing Happened on the Way to the Temple Mount: Author Finds It Hard To Conceal His Jewishness." The gunmen went door to door in the Kenyan costal town, demanding to know if the men inside were Muslim and if they spoke Somali. If the extremists did not like the answer, they opened fire, witnesses said on Monday. The several dozen gunmen also went door to door. "They came to our house at around 8 p.m. and asked us in Swahili whether we were Muslims. My husband told them we were Christians, and they shot him in the head and chest," said Anne Gathigi. 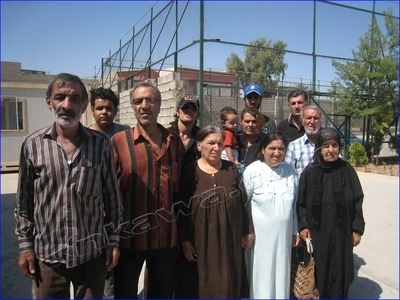 Sep. 15, 2014 update: A dozen Assyrian Christians in ISIS-controlled Iraq faked conversions to Islam to save their lives, then fled to Kirkuk in Kurdistan and renounced their conversions. The Assyrians who saved their lives by fake-converting to Islam. When we got down, passengers were separated according to Somali and non-Somalis. The non-Somalis were ordered to read some verses of the holy Koran, and those who failed to read were ordered to lie down. One by one they were shot in the head at point blank range. The hijacked bus, belonging to a company named after Mecca, the holy city of Islam. Some (illiterate?) 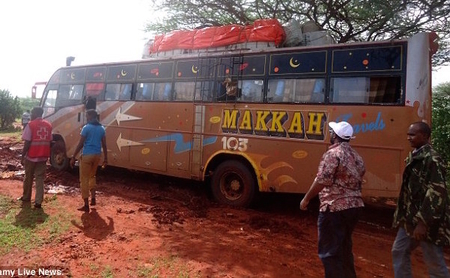 passengers escaped death by managing to recite Koranic verses from memory: "Three people who were due to be killed were reportedly spared after managing to successfully recite some of the versus." The Mujahedeen successfully carried out an operation near Mandera early this morning, which resulted in the perishing of 28 crusaders, as a revenge for the crimes committed by the Kenyan crusaders against our Muslim brethren in Mombasa. The stabbings of two people at a Detroit-area bus stop began with what police said was a simple question: Are you Muslim? ... When two people responded that they were not, Hawkins said, Thomas allegedly "became upset by that answer, saying he was Muslim and it was not acceptable that they were not." One student who witnessed the attack said he could hear militants opening doors and asking those hiding inside if they were Muslim or Christian. "If you were a Christian you were shot on the spot." Christians are now converting to Islam in large numbers just to be safe in case Al-Shabaab strike, while those who have not converted fully are attending madrasas to learn the Quran and Muslim prayers just in case. ... The Kiambu Governor attributed the move by Christians to convert to Islam to the technique the Al Shabaab are using where they spare Muslims and those who recite the Quran and kill Christians like insects, just like it happened in Garissa University and Westgate Shopping Mall. "If students in Garissa University knew the Quran and how to pray in Arabic, they would be alive today. That is the fear the Al Shabaab has instilled in Christians who are now becoming Muslims as a matter of necessity." Nov. 21, 2015 update: In the attack on the Radisson Hotel in Bamako, Mali, (again, Africa) that killed at least 20 persons, "at least one guest reported that the attackers instructed him to recite verses from the Quran before he was allowed to leave the hotel." Mar. 13, 2016 update: Islamists on a murderous rampage yelling "Allahu Akbar" at a tourist hotel in Grand Bassam, Ivory Coast, separated Muslims from non-Muslims, with the usual treatment: The Daily Mail quotes a witness, Marcel Guy: "A man with a long beard spoke to two children in Arabic and spared the life of the one who was able to recite an Islamic prayer. "The Christian boy was shot and killed right in front of my eyes." how the gunmen - who were armed with automatic weapons, bombs and makeshift machetes - had split the diners into two groups. Rezaul said: "[Non-Muslims] were taken to the upper floor and the Bangladeshis were kept around a table." He said his son told him the terrorists "did not hit people who could recite verses from the Koran. The others were tortured." He added: "The gunmen asked everyone inside to recite from the Koran. Those who recited were spared. The gunmen even gave them meals last night." July 6, 2016 update: India Times carries a story by Kunal Anand about a surge in Google searches for "Quran verses" that he attributes to non-Muslims wanting to learn "Which prayers of Quran I should learn in case terrorists ask me to recite some and save my life?" Sep. 17, 2016 update: Dahir Adan, a Somali-origin Muslim living in Minnesota, asked at least one of his victims during a knife-wielding rampage whether or not he too was Muslim. Jan. 19, 2017 update: In a particularly dramatic case of passing as Muslim, a jogger saved his life in Birmingham, England (and not Iraq or Kenya), by pronouncing the Shahada to his would-be killers. As I jogged past, the one with a rounded face punched me full force with his left hand, into my right cheek. I went up into the air and into the water. I sank and was completely submerged, my feet were not touching the bottom. I opened my eyes and could see brown muddy swirl around me. The water was so cold that I couldn't breathe properly. All I could do was kick my feet to get to the surface. The one who punched me was waiting at the side of the canal with an incredible look of pleasure on his face. He was waiting to watch me suffer or to come back so he could hit me again. I was able to identify them as Pakistani as I've worked in Muslim communities and have a detailed knowledge of Islam and speak Arabic to a certain level. I also used to teach asylum seekers for a while. So in that moment I said something in Arabic - a Muslim declaration of faith [the Shihada]. As soon as I said it, a look of panic spread across their faces. I then shouted in Arabic, "May God forgive you." At that moment they looked like a bunch of terrified schoolchildren. That's what ended it. It would have been prolonged otherwise, I believe. What I said made me human to them, gave me an identity. They started seeing me as a person. Oldham picks up the story: "Struggling, Lee managed to pull himself from the icy waters, cutting his legs badly in the process. His mobile phone, keys and glasses were lost in the canal, along with a memory stick containing college lessons. Incredibly, he saw four of the group up ahead as they headed into trees to hide and he followed, although the thug who attacked him had run elsewhere." As they were unable to outrun me they stopped and turned to confront me, but they were met with the offer of a handshake. As I have a detailed understanding of Islam, I was able to talk to them about the positive aspects of Mohammed and Islam and how their actions had been completely contrary to this. They said they were very sorry this had happened. They then walked off and I walked home. I was furious at the time but I am quite proud that I had them cornered but the first thing I did was offer my hand and spoke to them about the attack from the perspective of their faith. The four boys admitted that the attack happened because I was white and I explained that in the current political climate, such actions could have a negative effect on the Muslim Pakistani community which they are supposed to be representing. They were very ashamed and embarrassed. I'd got the impression that the other four were like lads, not gang-like. It was the one who punched me who really appeared to have enjoyed what he did. That punch also damaged my teeth, cheekbone and neck muscles. I am having to have an emergency dental appointment and I've got a lot of bruising along my neck and up into my eye. It's created a lot of pain." They ran away too when I spoke to them in Arabic, they left a person in distress. The fact they did not have it within them to help. "They said they were very sorry they did this. One in particular: I could tell he was very sincere when he said it, he was very upset. I hope that by acting with forgiveness, I have had a positive impact on the boys. (1) This is the first such incident in the United Kingdom that I know of. (2) It's also an especially dramatic case of using Islamic phrases to save one's life. (3) The Birmingham Mail emphasizes Skinner's knowledge of Arabic but this is beside the point; the key is the Islamic content of what he said. (4) "What I said [pretending to be a Muslim] made me human to them, gave me an identity. They started seeing me as a person. ... The four boys admitted that the attack happened because I was white." Islamic supremacism shines through these words loud and clear. (5) I reiterate the need for everyone to learn the Shahada and Fatiha, and to do convincingly, articulately and with a reasonable accent. Comment: Assuming the jihadis knew they were attacking Christians, the demand to recite the Shahada in this case appears somewhat different from the norm: not to separate kafirs form Muslims but to confirm the kafir nature of the intended victims. [Khobar Rampage:] "Don't Be Afraid, We Won't Kill Muslims"